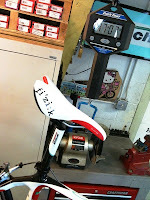 stickboybike: 2010 Infinito Ultegra weight. Yesterday's trip to Nashville couldn't have been timed any better. While visiting GFC, the FedEx man delivered two spanking new C2C Infinito Ultegras. Giddy as my 7 year old this past Christmas, I talked Lynn into letting me turn some wrenches on one of the newly delivered bikes. 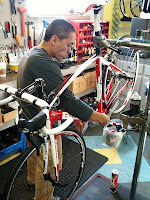 Not wanting to 'taint their finishing touches' on the build, I handed the bike over to Jeff for bar wrapping and cable cutting. I'm not sure what's in Jeff's cheek, possible a ball of Redman chew? 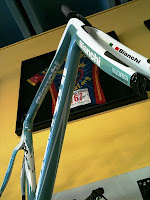 So, the Bianchistas want to know, how much does this bike weigh? Out of the box, all stock, sans pedals and accessories for a 57cm frame size-- 17.07lbs That's awesome for a bike with a non-racing wheel set. I recall in my retail days, stocking a 2007 C2C 928 Dura-Ace with Mavic Elites for pretty much the same weight. And this is full Ultegra 6700 at $2999.00 usd.! The money shot. I simply adore the bottom top tube logo and Italian flag on the fork legs. I need a 61cm please! Thursday night pot-lucks are a great idea!